Discussion in 'Downhill & Freeride' started by sgarstin, Feb 14, 2013. Here is a short video from last summer. I got the Knolly Chilcotin in 2012 with the intention of doing all-mtn riding but more on the downhill side of things and a few DH races for fun. I looked at the geometry numbers before buying and felt like it was what I wanted. I used to be pretty big into racing and then quit, and didn't ride at all in 2011. In 2012 I got the itch to ride again and this bike really got my stoke back. It obviously has its limitations when riding some fast and rough stuff, but I ended up doing 7 races on it and felt like I would have done just as good as if I was on a full blown dh bike. Mind you this depends on the course as well. The bike is set up pretty DH specific, with dh tires, chain guide, flat pedals (personal preference), CCDB Coil, Fox Vanilla 160 kashima, short stem and high cockpit. The Fox Vanilla is without a doubt the best fork I have ever had. Mind you I have only ridden Boxxer WC air forks before. With the high cockpit I found I was able to weight the front end, while staying more central on the bike and not having to shift my weight back if it got rough. I felt like I moved less forward to back and basically was fighting the bike less. I used to be trend follower of the low front end but not anymore. The BB height is around 14" and 66 degree head angle. 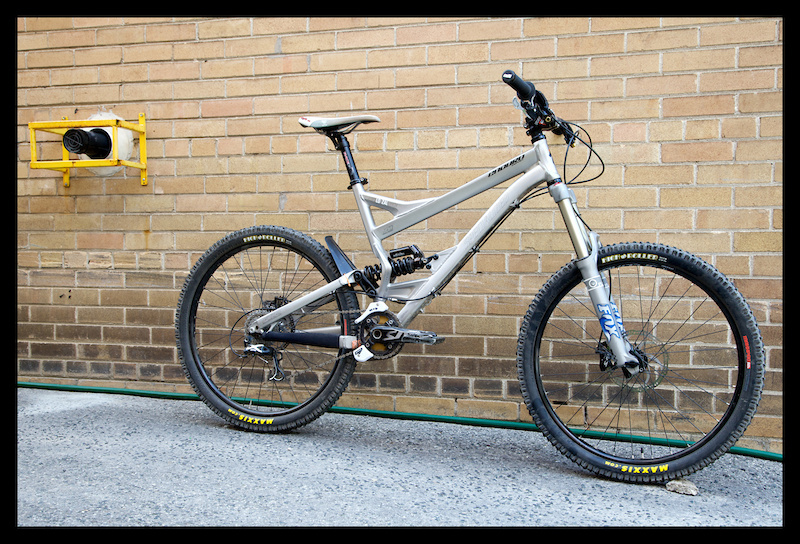 The wheelbase is 46", with a 16.9" chainstay. Geometry from the front to center was pretty much the same as I would want with a full on dh bike. I am 5',9" ish so this size actually really complimented my size and riding style. I felt like I could come into sections before corners faster because I could actually turn sharper. For 2013 I can't really justify a DH bike. I will race on my Chilcotin again, but I am going to try clips and getting some real DH brakes. I am pretty excited to say the least! Anybody else out there riding a DH trailbike? How has it changed your riding? Nice vid! I've thought about building up a chilcotin but I already have a delirium so it's tough to justify as I'm not sure it would be worth while for me. I do love my delirium and feel it's an incredible heavy am/mini dh rig. If I come across a chili frame my size at the right price I might just build one up if only to see how the grass feels on the otherside. Nice riding! I am pretty stocked by 160mm fork capabilities! They are fun play bikes, but no where near as capable as a proper DH rig when it comes to hauling a$$ or sending it. Still the most fun for an all around bike. I sold my DH bike last year as i wasn't racing so much and it just wasn't getting the use. I've also decided to go for a Banshee Rune, looks like it'll take a kicking and not be too arduous on the climbs. I plan to build it up fairly light but i have a spare set of DH wheels which i'll use for smashing out DH runs/trips to the alps etc. I used to race my HT DH a fair bit and you'd be surprised what you can get away with, like Tomasis says though, nothing can really replace a full on DH bike! Keen to see what other peoples thoughts are on riding DH on wee(ish) bikes!